As an IT Administrator, you endeavour to ensure that the technology you choose to use makes a positive impact on the business, and you are always looking for new ways to use technology that will bring additional benefits to your organisation. Take the new web filtering software you may be considering, for example. Web browsing activity logs are a gold mine of information – containing details about the websites which users visit (or are blocked from visiting), the time they spend on certain types of websites, the words they use when doing web searches, and so on. It is information that could be sliced and diced to extract additional value that could be useful to different stakeholders in your business. Isn’t the amount of bandwidth consumed over a week something you would want to know about – especially if you are having bandwidth issues and paying a lot for it? Don’t you want to know who is consuming most of your precious bandwidth, when they are using it and which websites they are visiting? Don’t you want to know how much bandwidth is being consumed by non-business related applications such as YouTube, Vimeo and other streaming media websites? This data can help you decide whether or not you need to implement user controls, or free up bandwidth so that those who need the bandwidth actually get to use it. What if somebody is spending most of the day browsing shopping sites? Is this not an indication that this individual’s workload is not being scheduled correctly, or that perhaps they do not have enough work to do? And if a user is browsing/searching for “torrents”, isn’t that something which you, as an IT Administrator or a C-Level executive, should know about sooner rather than later, so that you can avoid any potential legal issues and minimise security risks? Knowing that this information is available, if only you could find the right software tool to help you mine it, is one reason why you may want to consider GFI WebMonitor®. Its intuitive dashboards and extensive range of reports enable you to easily access to this “investigative” information. The product features a large number of out-of the-box reports to give you the information you need, quickly and easily. To help you choose the report that is most useful for your needs or to help you solve a particular problem, have a look at the infographic we have created. You’ll quickly find a report that can help you, your HR manager, your CIO or other executives within the company. Which of these reports do you think would make a positive impact in your organization if it was scheduled every week to your HR Manager? What would your CIO want to see? Which reports do you as the IT Admin need to get in your inbox weekly? 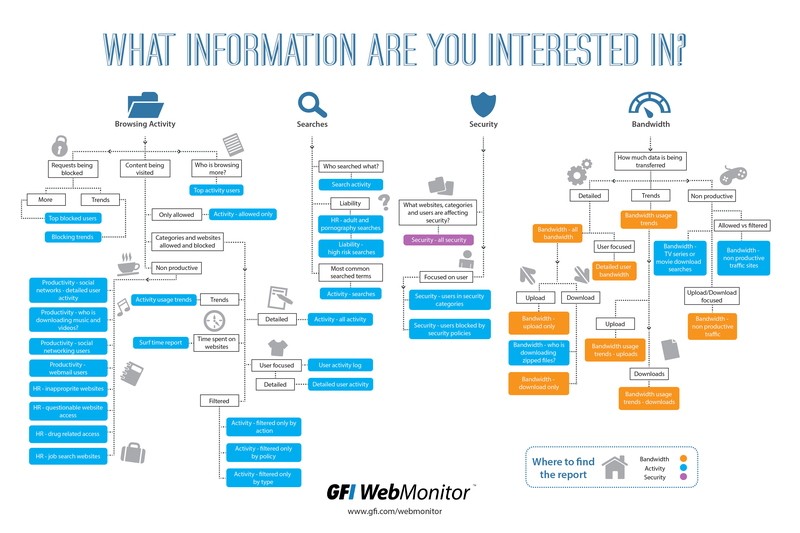 If any of the reports are of interest to you, why don’t you take GFI WebMonitor on a trial run?